In this week’s episode, Andrea sits down with Jeff and Alberto to discuss their current contest-preps. The group go back and forth comparing and contrasting the similarities and differences, between the two protocols. Topics covered include: Nutrition, Training, Cardio, Competition Schedules, Body-Weights, Predicted Peak-Week Strategies, and more. Along with discussing the technicalities of their programming, each coach touches on a few personal aspects about their prep, what their biggest struggles have been, and what the future holds for them and their bodybuilding careers. Join us this week for an entertaining and informative look at two professional natural bodybuilding preps. 2:06- What does this year’s competition schedule look like for each of the coaches? 8:10- How did they begin their prep? 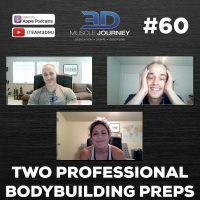 17:22- How has their training shifted throughout prep? 39:00- What does their cardio programming look like?